The Miniature Schnauzer is a small dog, with masses of hair on its elongated head. This dog has a square shape, with oval, dark eyes and a short tail (usually docked). It has a strong, long muzzle and coat colors come in black, white, salt & pepper or black and silver. The hair is harsh and wire-like on the body, but softer and longer on the face. This breed has a sturdy and neat appearance, and its dark eyes lend it an intelligent and watchful expression. You can get Miniature Schnauzers in pure white, but these are not recognized by the American Kennel Club. Intelligent, loving and loyal, the Miniature Schnauzer makes a great companion and family pet. This breed has lots of energy and is very affectionate and eager to please. 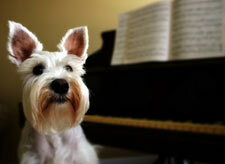 The Miniature Schnauzer is also a very alert and playful dog, and has a great deal of courage. The Miniature Schnauzer will think nothing of challenging larger dogs, and makes an excellent watchdog. This breed can vary in temperament, so you should always look into the temperament of the parents before making a firm selection. The Miniature Schnauzer will get on with children and other animals when properly socialized, although they may be a little anti-social with other dogs. The typical Miniature Schnauzer can reach around 12-14 inches in height. The weight of the average Miniature Schnauzer is around 10-15 pounds. The Miniature Schnauzer can suffer from skin problems and hereditary eye disorders. Live disease and diabetes are also health risks to look out for. This breed can quickly put on weight and become obese without proper dietary care and exercise. The Miniature Schnauzer does not necessarily need a yard or garden, and can live just as happily in an apartment as in a house. However, if you do not have a garden, you must ensure that he received regular walks and exercise. These dogs have plenty of energy to burn and are prone to weight gain, so regular exercise is a must. The Miniature Schnauzer will enjoy a long walk each day, and his love for companionship makes him the perfect sort of dog for interactive play, which will give him enjoyment and exercise. This breed has no special dietary requirements other than nutritious, good quality food. However, care must be taken not to overfeed the Miniature Schnauzer, as these dogs are prone to weight gain. You must provide access to fresh, clean water at all times. The Miniature Schnauzer has a good life expectancy of around fifteen years. Obviously, this is dependant upon the dog’s overall condition and his health and lifestyle. The coat of the Miniature Schnauzer should be brushed on a daily basis to avoid matting. You will also need to take him to have his coat clipped every six months or so. Take the opportunity to check your dog’s eyes for any signs of infection of problems when grooming, as this breed is at increased risk from eye problems. The Miniature Schnauzer originates from Germany, and although there is no definitive information with regards to his ancestry, it is thought that he may have descended from breeds such as the Poodle, Affenpinscher, and the standard Schnauzer. This breed was used for rat-catching, a skill at which it proved excellent. The Miniature Schnauzer was also used for hunting, guarding and herding. The Miniature Schnauzer was first registered by the American Kennel Club in 1926. "Hello, I began this new adventure in dog training due to my deep love for homeless kids and dogs, whom I believe yearn a childhood full of love and care and fantasy no matter they have lived a crueler and harder life than any of us will ever know. My dream is to bring both together under one roof and Im sure I have taken the correct path in investing my money in dog training courses such as Secrets to Dog Training. I want to be the last last opportunity for many and the first for some in this country where animals are still not treated with respect nor are the kids known as "disposables". One day I will be able to raise the funds I need since I believe in the human species and definitively God is with me. I immediately started with the Alpha Dog lessons and got across to Jack that I am the Alpha Mommy. I had no idea that doing something as simple as making him sit before I put his bowl of food down would make a difference in how Jack viewed me. Jack has made great progress. His has become confident, less anxious and likes to practice commands every day. We still need to work on a few areas, but it's only been less than three months! Jack is much happier knowing that we are the pack leaders who protect, feed and love him. I recommend Secrets to Dog Training to everyone who has a dog as a companion. I have learned so much about dog behaviors and how to respond accordingly without yelling or intimidating. Thanks Dan for writing such a great learning tool!" Want to find out about more dog breeds? Search here or go to our Dog Breed index.